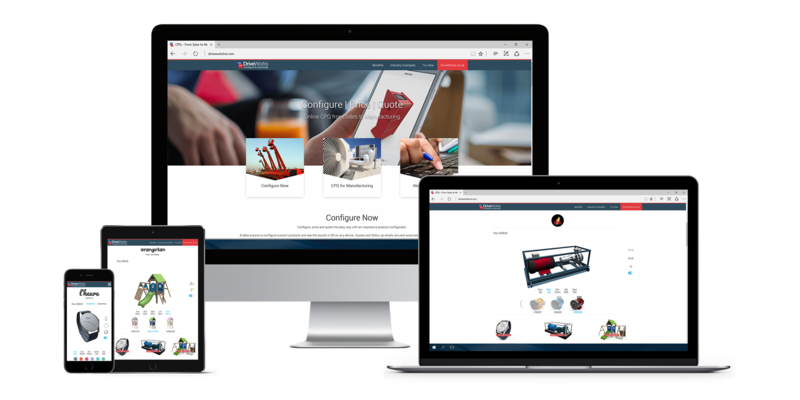 Using DriveWorks online sales configurator, customers can develop a product and even see a real-time 3D preview based on their own needs and preferences with minimal input. Engineers can build rules into the configurator which means that customers and sales personnel can only configure products that can be manufactured. CPQ software enables companies to develop customization strategies that provide superior service while also ensuring that their business operations are running smoothly. Therefore, the ability to configure, price and quote easily has become essential for companies of all sizes, in all industries. Not only does DriveWorks enhance the customer experience from an ordering standpoint allowing the customer to easily pick and choose options, see live pricing data and generate fast accurate quotes, but it also works to enhance the engineering and manufacturing side of things as well! DriveWorks is a CPQ solution that works on two fronts, the customer experience and the engineering design process. With DriveWorks world-class SOLIDWORKS automation capabilities, once a customer submits their customized product, DriveWorks will be ready to create all the engineering data necessary for manufacturing to create it, which means customized products are possible without extending engineering time. All the SOLIDWORKS parts, assemblies and drawings can be automatically created and used to quickly fulfill a client’s customized request. DriveWorks software is used for design automation and sales configuration by companies large and small. Whether you are an engineer that needs Design Automation to automate your SOLIDWORKS models, or a company wanting to provide a product configurator and guided selling for your sales teams, distributors and even customers, DriveWorks software is modular and scalable. You can implement DriveWorks and grow your projects at your own pace. Are you interested in learning more about DriveWorks? Click the button below to watch our On-Demand webinar.